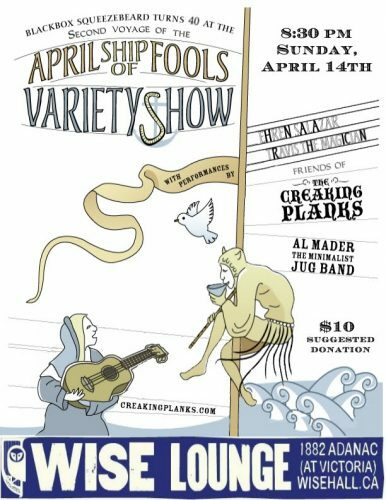 The Second Voyage of the Ship of Fools, celebrating the 40th birthday of Blackbox Squeezebeard, featuring performance by Travis Bernhardt, poetry by Al Mader the Minimalist Jug Band, and music by Ehren Salazar and friends of the Creaking Planks. Downstairs at the WISE Lounge. Suggested donation $10, doors at 8:30.